Hawk Bivi Bag Review Now Online! Today sees the release of the final bivi review kindly provided by Gordon of Highlander. Previously with Ubar’s assistance I reviewed the Rip-Stop Bivi Bag, and today I have reviewed the Hawk Bivi Bag for your viewing pleasure. If the Rip-Stop was the no-frills approach to dry field-camping, this is the Ritz! For those not familiar with the concept of the bivi bag, such a piece of kit is used in place of a tent, and effectively serves as a waterproof layer for a sleeping bag, allowing you to sleep out in the open without getting soaked in the process. Highlander is a manufacturer / wholesaler who supplies a considerable number of the UK’s camping and hiking stores, and who is now keen to support the airsofting community as well – something I’m sure every airsofter will more than welcome! To view this review click here, or for more information about Highlander’s range of products click here. Airsoft Direct: Airsoft Guide 3 Now Available on Pre-Order! Airsoft Direct has been the proud stockist of the fantastic Airsoft Guide DVDs for some time now and we have recently added AirsoftGuide DVD Volume 3 to our website so that is it now Available for Pre-Order! Copies are due to arrive on the 1st of November but this is of course subject to change, updates will be posted on our website and on the forums. More stock of Volume 1 and 2 will also be arriving on the same date, for details on the full range please visit the DVD section of our website, here: http://www.airsoft-direct.co.uk/products.php?subcat=184&cat=1001. Price is the same low special offer price of £9.99 (Normal RRP £12.99!) as the previous copies and postage is only £1.95 via Royal Mail 1st Class Recorded for a single copy. To place an order, simply visit the Volume 3 product page of our website. Well, dEFCONairsoft is officially 1 month old today! (24th October). We’ve had some tremendous support from the Airsofting Community, and over 1425 unique visitors in 4 weeks, which isn’t bad at all, as well as countless other return visits. What we’re looking at now is improving the website, as it’s aimed at you, the Airsofter. So we’re asking people to take a look at dEFCONairsoft (http://www.defconairsoft.co.uk) and give us your feedback and suggestions. Tell us what you like about the site, what you don’t like and what you’d like to see more of. We will try and incorporate all of your suggestions over the coming months. Whilst I’m on the subject of training gear and simulation equipment, there’s some more interesting gear over at RAP4 including some decent looking P99 .43cal (~10mm) pistols. Powered by CO2 they take a plastic banana magazine and can be adjusted for power output. Also available is a P226 replica which should hopefully be of interest to serving police units looking for safe and cheap training aids for simple training exercises. The P226 has been out and about for a bit and uses the same internal mechanism (for the simulation version) as the P99 above. True they’re not 100% perfect in terms of the simulation effect, however they look the part, are functional in terms of action and controls and when used with the appropriate safety equipment are as safe as you can get. 1st Protocol in Southern California, USA are having a pre-Halloween sale on their pistol range (you’ll save around 10-20%). The Kalashnikov AK-47 is the most widely used assault rifle in the world; we’ve taken its classic lines and melded them with the powerhouse T68 internals to create the T68 AK47 for scenario paintball and military training. The T68 AK47 is designed as the “opposing force” weapon to enhance military combat training, and for when you just want to play a bad guy for the weekend. The T68 AK47 features the same inherent reliability and durability of our T68 line, by virtue of being made almost completely of metal. It weighs 6.4 lbs with an overall length of 35 inches, and to replicate the real deal, the buttstock, pistol grip and handguard are made of wood—the T68 AK47 is made to take a beating. The T68 AK47 can be powered by CO2 or compressed air and it is compatible with any size air tank or cylinder. The T68 AK47 shoots standard .68 caliber paintballs and uses a standard hopper. It has an adjustable velocity range of 200-400 fps, with a maximum range of 300 feet and effective range at 150 feet. With these features, the T68 AK47 is an outstanding paintball marker for scenario players and for those you need reliable and durable gear; and best of all, the T68 AK47 is the best combat training simulations tool for OpFor. If you could please let people know that the Darknightsociety website has been updated. All you can see from the pictures so far is that it’s a SIG copy designed for law enforcement training purposes (hence the blue slide). I’m pretty sure this is designed to work with Bioval’s vest/helmet sensor system. Apologies the 4th image didn’t make it through the mail system here that well, but has been included as it shows the slide detail. 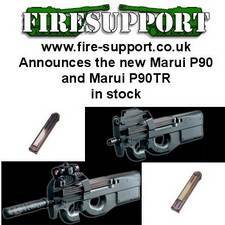 Firesupport have just received there latest shipment of Tokyo Marui AEGs. We now have in stock a limited number of the best gearboxes money can buy – PGC. We have metal CNC’ed gearboxes for STAR M249, CA/TOP M249, Marui M4A1 and TOP MP40. Gordon of Highlander has kindly provided some more items for review. Today sees the turn of a Rip-Stop Bivi Bag, an essential piece of kit for anyone planning on participating in mil-sim events where a tent is not appropriate. For those of you not familiar with the brand behind the Bivi Bag, Highlander are a manufacturer / wholesaler who supply a considerable number of the UK’s camping and hiking stores, and who are now keen to support the airsofting community as well – something I’m sure every airsofter will more than welcome! Update: You can find the M2019 now at either eBay or Monsters in Motion. Just wanted to let everyone know that JungleToy is having a Halloween special sale online at www.airsoft128.com. Any order over $120 will get a free BE-Tech G36K style Electric Rifle absolutely free included with the shippment. Limited time offer, while supply last. Offer expires Oct 31st. 2006.